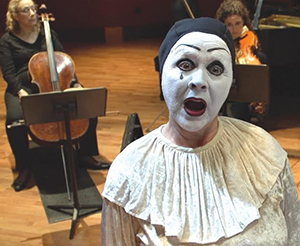 Three Notre Dame faculty members in the Department of Music teamed up with members of the South Bend Symphony Orchestra and two Chicago artists to film a dramatic performance of Arnold Schoenberg’s Pierrot lunaire, to be released on DVD and Blu-ray this month. The performance is directed by the South Bend Symphony Orchestra’s Tsung Yeh and includes Professor Georgine Resick as the reciter, Associate Professor John Blacklow on piano, and Associate Professor Karen Buranskas on cello. The initial screening of the film will take place in the Browning Cinema of Notre Dame’s DeBartolo Performing Arts Center on February 22, 2015. Composed in 1912, Pierrot lunaire set to music 21 poems written by Albert Giraud and translated into German by Otto Hartleben. It was among the first pieces of chamber music to use a mixed grouping of strings, woodwinds, and piano, and composers still use the “Pierrot ensemble” today. Pierrot lunaire is inspired by the commedia dell’arte, a medieval Italian form of theatre with masked characters. The film returns to the atmosphere of the commedia dell’arte with full costume and makeup, leading to beautiful but sometimes disturbing imagery. Resick said Pierrot lunaire captures the emotion and drama of Schoenberg’s innovative early work. The film could catch the attention of television broadcasters, and even Grammy nominators, Resick said, but it will have academic applications as well. The film was funded by grants from Notre Dame’s Office of the Vice President for Research, the Institute for Scholarship in the Liberal Arts, the Nanovic Institute for European Studies, and the Department of Music. Resick said this funding was critical to producing a performance film at this scale. “We are very fortunate here at Notre Dame to have supporters within the University who understand that it is difficult for faculty in the performing arts—music, theatre, even visual arts—to gain grant funding for projects we would like to do that might have a significant impact on scholarship in the field,” she said. Originally published by Emily McConville at al.nd.edu on January 05, 2015.